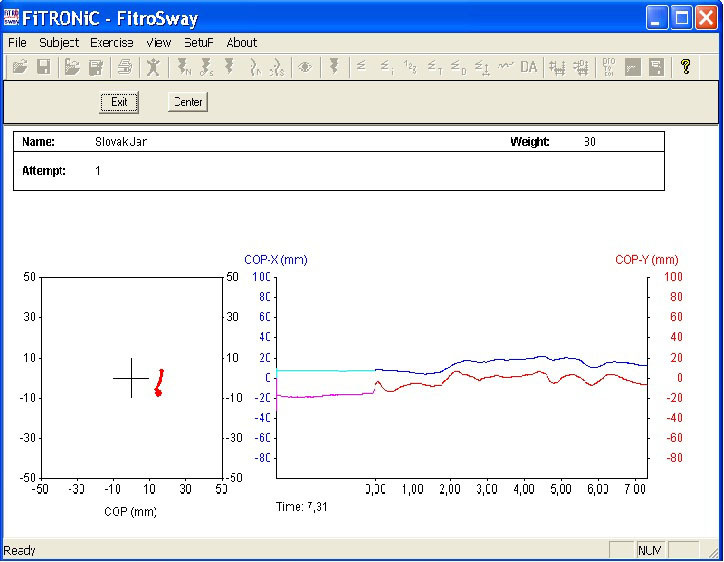 A computer based system for the assessment of tapping frequency. The system consists of two contact switch mattresses connected by means of an USB interface to the computer and special software. 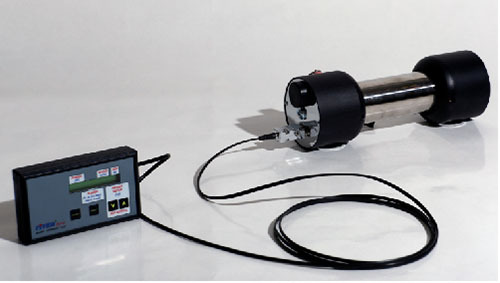 The system measures „contact“ and „flight“ times in miliseconds and calculates the cycle time as well as the corresponding tapping frequency for both extremities as well as separately for right and left side. 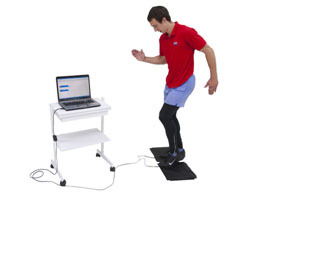 Test can be carried out in standing or sitting position. Also tapping frequency of the hand movements can be assessed by means of mattresses or special hand switches. 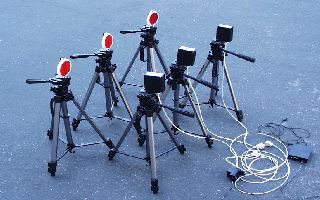 Maximal tapping frequency is usually assessed in 10-second test. 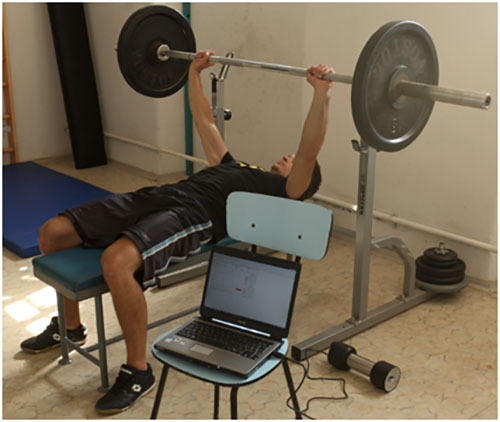 Longer tests (up to 300 seconds) can also be employed to evaluate the effect of fatigue on neuromuscular function. Fig. 1 shows on-line screen during the test. 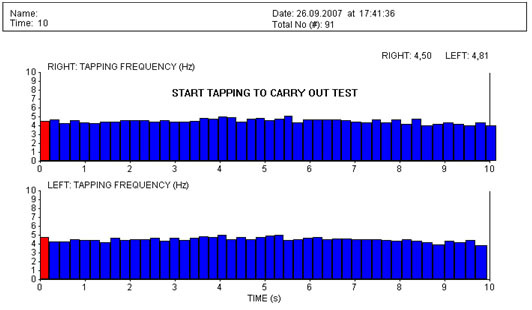 Additional parameter as number of taps, contact time (ms), flight time (ms) and tapping frequency (Hz) separately for right and left foot can be obtained after the test in report routine. Parameters can be displayed for each particular tap cycle with the means of entire test period (Fig. 2) or as the means and SD in intervals selected (Fig. 3). Fig. 2. Parameters of particular tap cycles and means of the entire 10-second test. Fig. 3. Parameters of 10-second test (means and SD) displayed in 2 intervals. 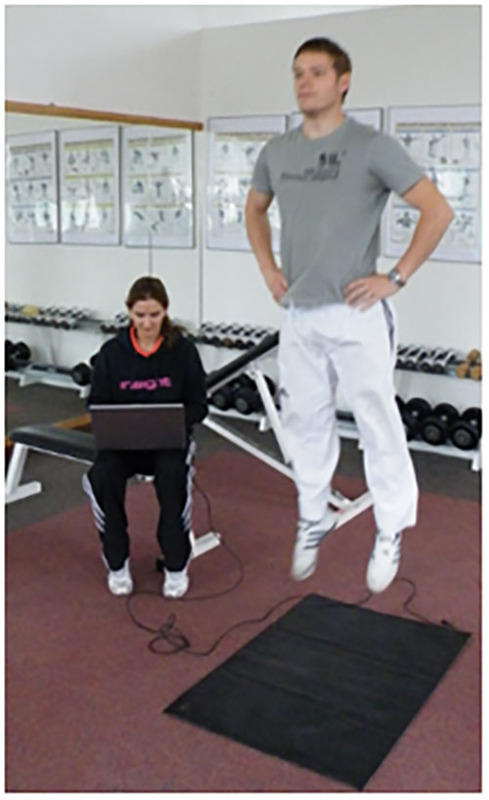 An example of results in subjects of different age and performance level (dancers and PE students performed the test in standing position, older people in sitting position) is shown on Fig. 4. Fig. 4. Tapping parameters as measured in 3 groups with different level of neuromuscular performance. Fig. 1. Tapping test in standing and sitting position respectively.